Howdy, knitters! I can’t believe another week has flown by already. If this is your first time at the Knitting Daddy blog, I offer you a hearty welcome! You might want to check out my knitting origin story to read about how I started knitting a couple of years ago, and then poke around the blog for things that look interesting to you. If you’re a returning visitor, I’m so glad you’re back! This week, I’m going to write about combining a couple of my favorite things: knitting and baseball! Before we get to that, though, let’s take a look at what’s been happening in my knitting world lately. I’ve been continuing to catch up with podcasts since I fell behind a few weeks ago when I was sick. I’m almost all caught up with my knitting podcasts, but the other things I listen to are still sitting on the shelf. Maybe in a week or two, I’ll catch up completely. But probably not. This week, I listened to podcasts from TwinSet Designs, Ewe University, Knotty Girls, Fiber Hooligan, Knitmore Girls, The Yarniacs, and knit.fm. In TwinSet Designs Episode 40 (But We Digress), Jan and Ellen spend a good amount of time talking about alpacas, specifically about taking them to shows. It was fascinating information, and a very enjoyable listen. In Ewe University Episode 23, Dr. Kelly reminds us that it’s time to start thinking about county and state fairs. The lesson this time was about “social snacking,” and it doesn’t have anything to do with food. As always, it was a great lesson, and I learned a lot that my introverted brain found interesting. In Knotty Girls Episode 27 (Emotional Yarn Buying (Or Laura Loves Rupert’s Biceps), Jen and Laura talk about all the amazing blockbuster movies that are coming out this summer. They also talk about knitting. In Fiber Hooligan (Drew Emborsky Is Back), The Crochet Dude joins Benjamin for his second appearance on the podcast. This was the first episode of Fiber Hooligan at their new podcast home. So if your podcatcher missed this episode, double-check to make sure you’re subscribed to the new feed. Drew and Benjamin talk about how Drew become the fiber icon that he is, discussed how design happens, and talked about Drew’s yarn lines. In Knitmore Girls Episode 283 (Soooooo Smart), Jasmin and Gigi talk about a lot of things, including their perpetual #OperationSockdrawer knit-a-long. I wish I could get Instagram working on my ancient iPhone so that I could post pictures of the socks I’m currently knitting…. Maybe I’ll figure it out at some point. In Yarniacs Episode 63 (Back To The Beach), Gayle and Sharlene introduce their colors of fall knit-a-long. In knit.fm Episode 8 (Design Process, Part 2), Pam and Hannah continue their discussion about the process of design. This is an extremely fascinating discussion, and I love a peek behind the curtain about how patterns come to be. Head over to their website for pictures of their design notebooks for an even closer peek! I really should get a design notebook together — I’d like to be a knitting designer when I grow up. As is always the case when a new knit.fm episode is released, it is my podcast pick of the week. There are, of course, tons of other awesome knitting podcasts out there. I don’t have time to listen to them all, so this is just a peek at what crossed my earbuds over the past week. 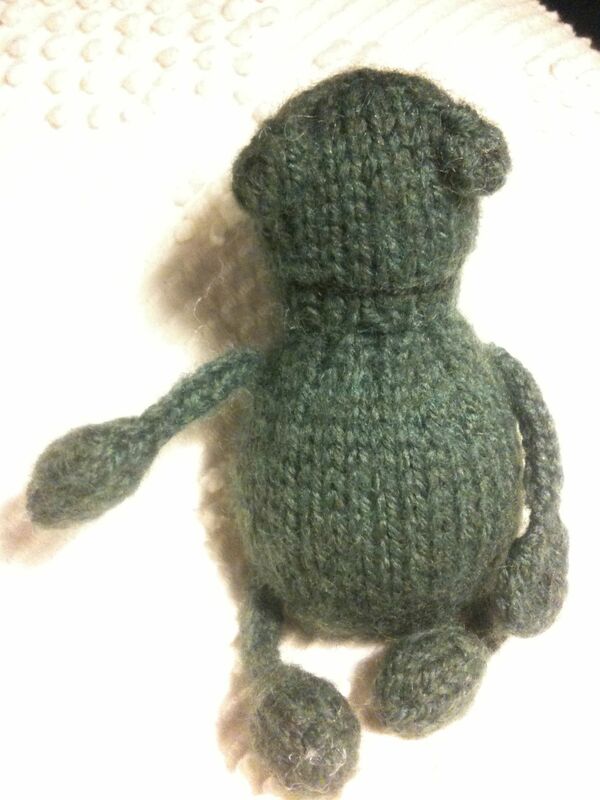 The Milo that I talked about last week totally won a prize in the Mad May knit-al-long on Ravelry! It’s more yarn! I’m very excited, and expect it to arrive in a few days. Yay for random number generators! I’m working on socks for myself. Last week, I talked about a couple of projects I recently finished, but didn’t have pictures for. I have pictures now. 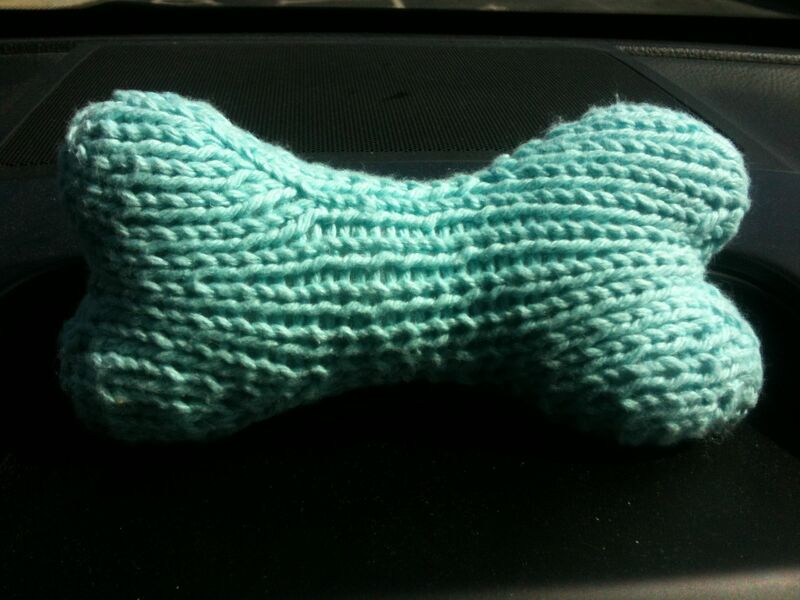 First there’s a dog toy I knitted for the May IBK Charity, an animal shelter. It was a simple, quick knit. If I do it again, I’ll probably use wool and felt it when I’m done. Ravelry Project Page: 2014-05 IBK Charity: Fetch ! The other project was a String-A-Long Frog toy. I love this pattern, and it’s really fun once you start knitting multiple versions of the toy and they can all hang out and play together. As far as I know, this pattern is only available through Susan’s workshops — so if you get the opportunity to take the workshop, jump on it like I did in April. The String-A-Long toys are more fun when there are several of them that can play together. 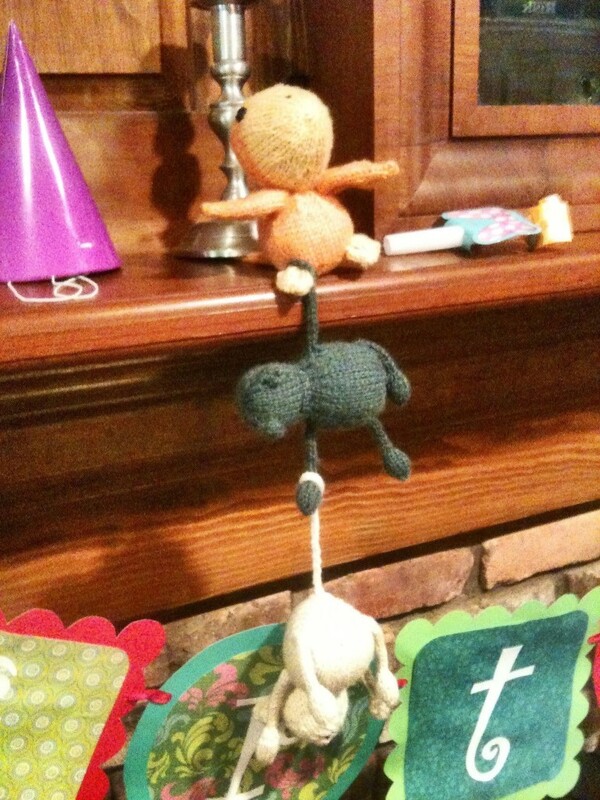 Yarn Used: Ummm…. it was green…. I first heard about this program last year, but heard about it too late to participate. I swore that I’d pay attention and participate this year. Then I got my dates confused, and almost missed it! It all worked out for me at the last-minute, though, and I’m glad that I was able to participate. 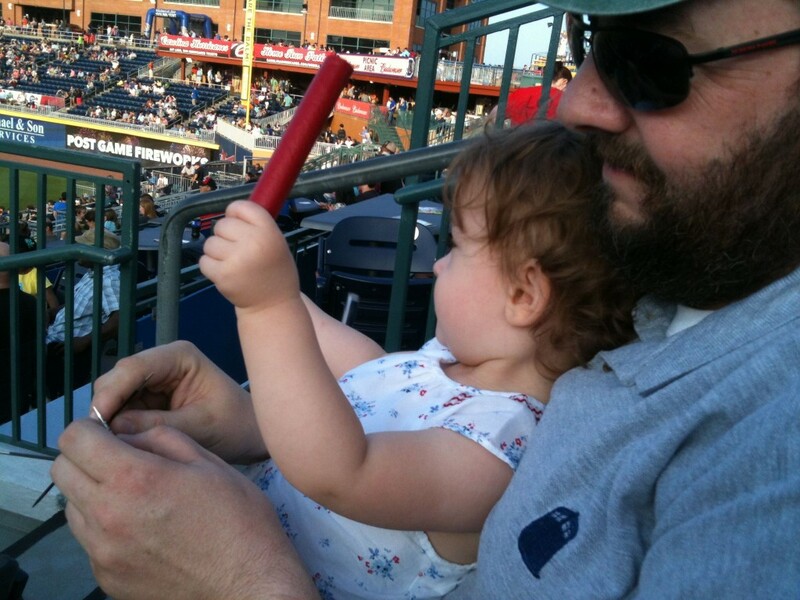 The most convenient Stitch ‘N Pitch for me to attend was last Friday, at the Durham Bulls game in Durham, NC. The Bulls are a Tripple-A affiliate for the Tampa Bay Rays, and I love going to games at their ballpark. 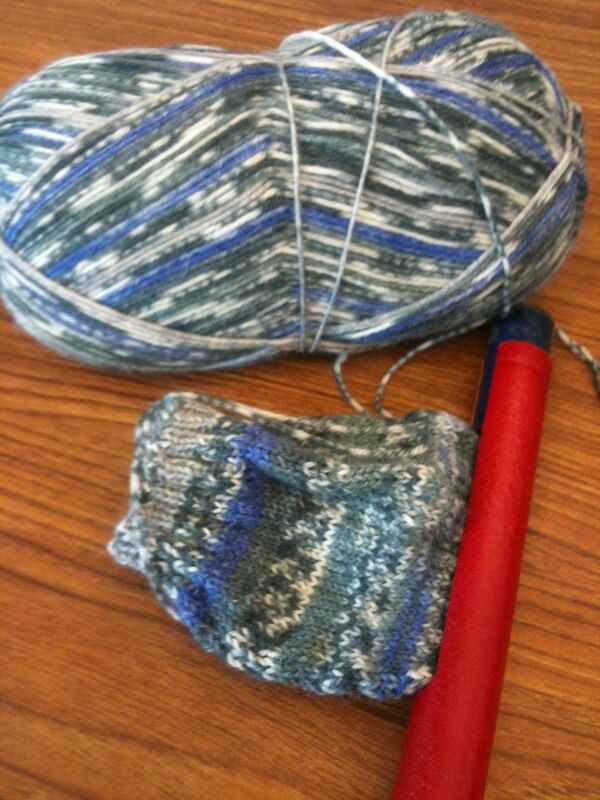 Combining it with knitting was even more exciting. Check out the Durham Stitch N’ Pitch Facebook page for more details about their event. The Durham Stitch N’ Pitch Organizers had an efficient operation set up outside the park for people to pick up their tickets and goodie bags. 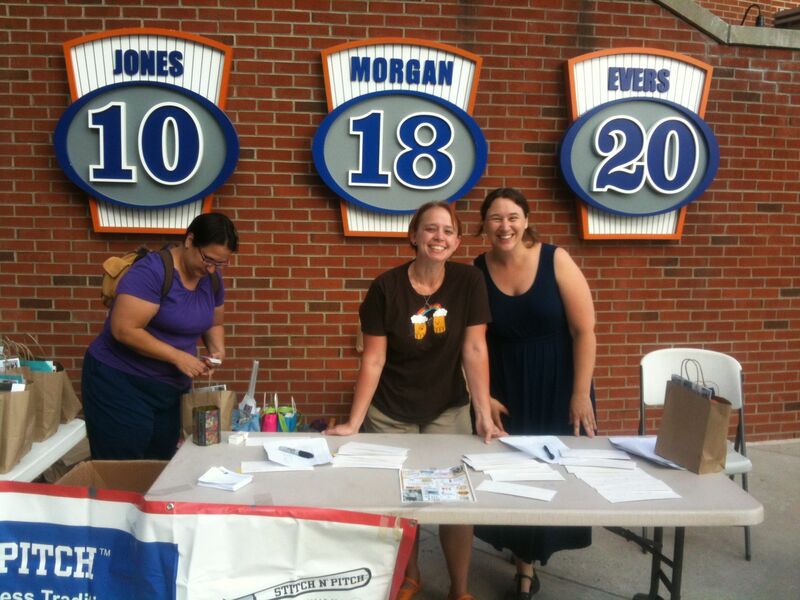 I arrived at the ballpark and was greeted by happy and friendly event organizers. They had a table where everyone who had pre-ordered their tickets was able to pick them up, as well as pick up the goodie bag that came with every ticket. The goodie bag included some Berroco Hurray yarn, a sample stitch marker, a crochet pattern, and lots of flyers and coupons that would be interesting for knitters and crocheters. I’m sure the goodie bag for other events is different — it’s whatever the particular event organizer is able to put together. The folks running the event in Durham were top-notch: very organized, very happy, and very friendly. All of the tickets were located in a block together, so once everyone got in their seats, they were surrounded by other knitters and crocheters. Almost everyone worked on a project during the game. I made some progress on my socks. It was so much fun! 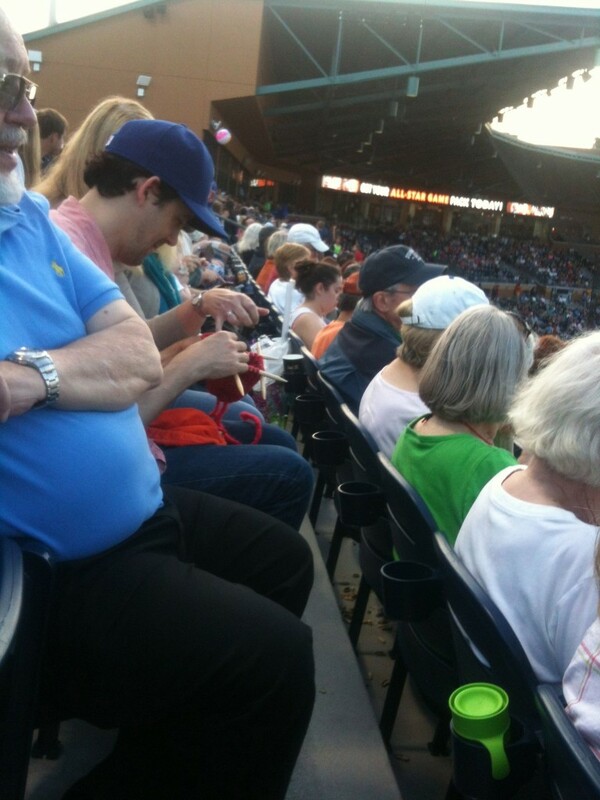 I wasn’t the only man knitting at the game! Even more exciting is that every ticket purchased included a raffle ticket. You could also get additional raffle tickets by donating hand-knit hats that would be distributed to a local cancer center. 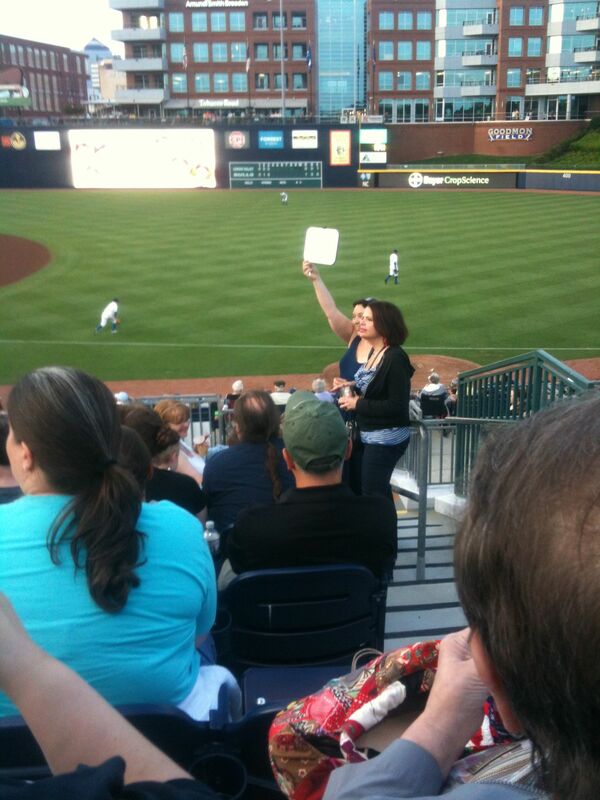 They gave out raffle prizes throughout the entire game. Some prizes were baseball related. Some were fiber arts related. Some were just generally crafty related. I didn’t win a prize, but I had fun watching everyone who did. All told, I think I heard there were about 50 prizes to be given away. That’s a lot of prizes! The turn-out was really good, too — I think there were easily over 100 people who attended. Rebecca is holding up the number for one of the raffle prizes. It was a lot of fun. I got to meet some more knitters. My family came, too. Blueberry loves fireworks (we can see the ones for our local baseball team from our front porch), and this was the first time she got to see them up close. I wondered if the noise would be too much for her, but she didn’t mind it (I plugged her ears with my fingers). She was laughing and pointing and naming all of the colors of the fireworks as they exploded. It was really neat to see the whole Durham Stitch N’ Pitch in action. I got the opportunity to talk with Rebecca, one of the organizers, about how it all works. I’m hoping to bring a Stitch N’ Pitch event to Greensboro, NC. Maybe not next year, but we’ll see…. Have you ever been to a Stitch N’ Pitch event? Join the conversation and leave a comment about what it was like at the event you attended. 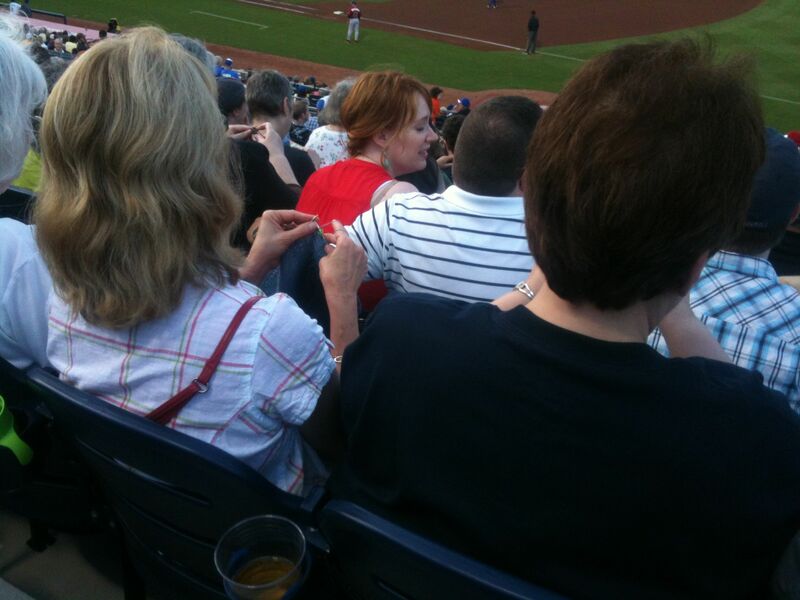 If you haven’t been to a Stitch N’ Pitch, have you knitted at other sporting events? What sort of reactions do you get? Wow! What a great blog… amazing, and your Knitting Origin story is so authentic and filled with hope. I’m sitting here reading it with Bob Seeger “Like a Rock” in the background. Perfect moment. Makes me want to get back to blogging. It was so nice to meet you today at The Fox in the Henhouse. Hope to run into you again somewhere with needles in hand. Hi, Becky! Thanks so much for stopping by and checking out my blog. I’m glad you enjoy it, and I’m glad you took the time to read about my origin story. Knitting really kept me going when Blueberry was so tiny and fragile. She’s doing great now, and I still love knitting. ok.. had to come back to add comment… Your show notes are fantastic…. as good as The Yarniacs’ Thanks! Stitch & Pitch looks so fun! I’ve brought my knitting to Hoppers games, but it’d be nice to see a group of knitters/hookers/spinners so I’m not the odd one out. If they organize one in Greensboro, count me in! It was so much fun! 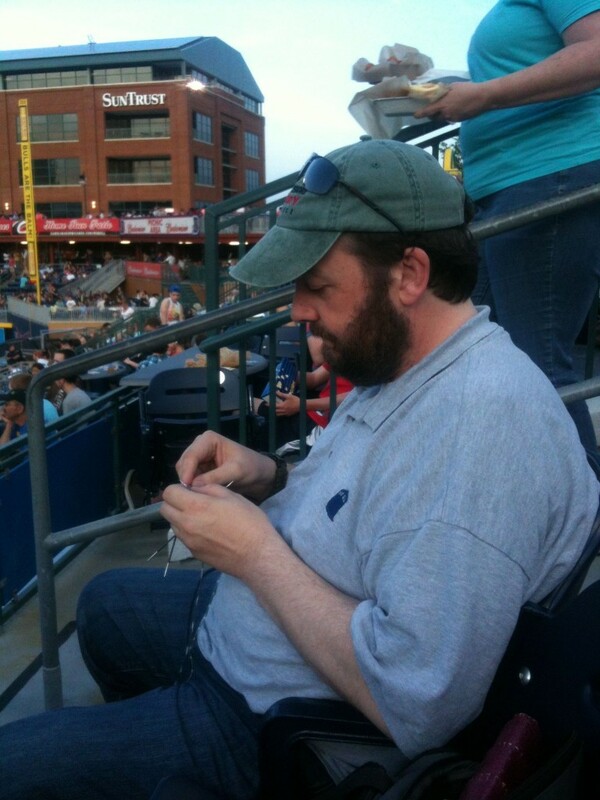 Let me know the next time you’re bringing knitting to a Hoppers game, and I’ll try to make it out to the park, too. I live just a few miles from the stadium…. Just found you blog – nice! I love Stitch n Pitch and I have been to 3. My first one was the Oakland A’s we we got an awesome stand up divided project caddy that I have used every since (2009?). Then I went to my first SF Giants SnP and got a really nice canvas multii-pocketed project bag, and the last Giants one I went to I got an XL T-shirt and I am 5’2″and weigh around 110 pounds – not good. I’m definitely looking forward to doing SnP next year, and hopefully bringing it to Greensboro soon.